It has stark and bold plumage and is large with a crow-sized body. It almost looks cartoon-like at first glance. A wary and shy bird that prefers isolated sandy or rocky stretches along secluded beaches. The posture and behavior is very plover-like. They run and stop to forage with their thick, knife-like bill. With the bill it pries open bivalved mollusks, clams and oysters. In 2001, the estimated population for the entire North American continental population was 7500 total individuals. This makes the American Oystercatcher a high conservation concern in much of its North American distribution range. 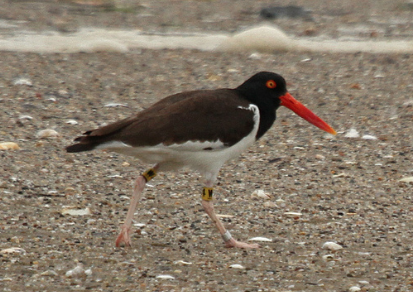 Two races of American Oystercatcher breed in North America: the eastern race along the Atlantic coast. The second race is along the Pacific coast from northwestern Baja California southward. In areas north of Baja California, the Black Oystercatcher is found.